This site is where Yekaterinburg's sporting heart has been beating for almost 118 years now. No wonder that it's exactly where the World Cup stadium was built, becoming the fourth to stand here. You might argue the third one was a disgrace, having been opened in 2011 and then demolished in 2015, but that's already the past. The new Tsentralnyi Stadion is here, even if temporarily named Ekaterinburg Arena by FIFA. Yesterday the official opening took place, combined with second test-match. With all 35,000+ seats open to the public and the mighty Spartak Moskva coming to town, the game has been sold out well in advance. Even better for the locals, FK Ural caused a major upsed by beating Spartak and possibly killing their championship chase after leading Lokomotiv. Of course it wasn't all about the game for Ekburg's residents. With over 300 volunteers directing them around the stadium, citizens also wanted to take a tour of their unique new facility. The circular stadium is indeed like no other around the world, having been built within historical walls from 1956. Not all the walls have been retained, but 4,000m2 of the original surface is still in place. Constrained spatially, the stadium has vertical circulation as its advantage, boasting 26 elevators for fans. 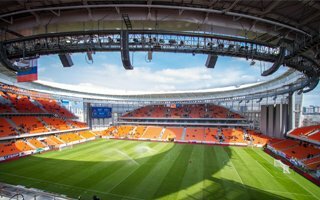 It asn't all roses yesterday, but the test went good enough for the metropolis of Yekaterinburg to announce readiness for stadium transfer to FIFA. Yekaterinburg as a host-city was an obvious selection in the Russian World Cup bid and we have to say the city's host stadium has been delivered against odds in a timely manner. They began late due to constant changes of the concept, but once construction started, it averaged between 500 and 1,500 workers on site at all times. As a result they managed to do what Saransk or Samara didn't, which is to hand over the stadium by the end of 2017. This left a safe buffer of 2 months for all proceedings and then open Ekaterinburg Arena for test events. Construction didn't exceed budget like it had in some other Russian cities. Sure, 13.1 billion rubles is more than the initial 12+ billion, but only just. It remains one of the best budgets across the Russian tournament. And finally, the stadium was mocked worldwide by sports media for having over 10,000 temporary seats added outside its permanent bowl. Well, it only speaks of those media outlets to criticise what is one of the best solutions used across Russia. While some other cities will struggle to fill their stadiums after World Cup ends, Yekaterinburg seems safe to operate its 23,000-seater. It's not even a novel idea, to be honest. It was done in Sydney in 2000, in Kobe in 2002 or in Sao Paulo in 2014. Especially for a stadium as confined as this one, it's a very sensible idea!